Herniated disc foot drop is caused by a trapped sciatic nerve. There are many conditions that can cause weakness in the muscles of the lower extremity. 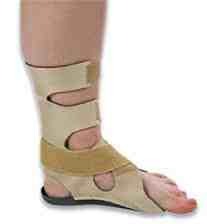 All are serious as this is a potentially irreversible syndrome causing permanent disability, and the need for a special brace or shoe. Many demyelinating neurological diseases like MS target the muscles of the lower limb; the nerve loses its fatty sheath and can no longer conduct resulting in profound weakness of the extremity. So too muscle wasting diseases may affect the lower limb. Uncontrolled diabetes too can effect the blood supply to the nerve affecting the foot, though more usually the quadriceps muscle is affected. In the case of the male, an awkward question must be asked; can you get an erection? Remembering that fifty percent of those with high blood sugar are walking the streets undiagnosed, this should always be considered. A stroke and cervical spinal stenosis too may affect the muscles of any part including the lower leg. What is a foot drop? The inability to raise the toes causes an unmistakable slap sound as the sufferer walks as the affected foot falls in an uncontrolled manner. Special shoes for foot drop may be required to support the ankle and enable you to walk; otherwise you would have to lift your knee so that the toes clear the ground. In short, there are many foot drop causes. The sciatic nerve is the longest in the body, originating in the lower lumbar spine, passing through the buttock, down the back of the thigh where it splits into the Tibial and Common Peroneal nerves; it's this latter nerve that passes around the side of the lower leg that is classically affected. Tibialis Anterior muscle which raises the forefoot. Extensor Hallus Longus which raises the great toe. If either are affected, a drop foot occurs, profoundly affecting the gait as you are unable to raise the fore foot when walking. You may trip and stumble. An injury to the tibial nerve doesn't cause the classical drop foot but, since it is even more commonly seen at the chiropractic coalface, I include it here. the calf muscles, gastrocnemius and soleus. Weakness means difficulty standing on the toes, raising the heel and controlling the ankle. An inversion ankle sprain is a not uncommon sequela. For simplicity, let's consider where pain comes into the equation. Is there no deep ache? Is there a searing burning pain, often with tingling? Conditions like polio, MS, diabetes, muscular dystrophy and stroke mostly do not cause pain in the lower limb. When absent, I immediately refer the patient for a neurological consultation; it's unlikely that chiropractic can contribute in the initial stages. A medical diagnosis must be made considering all the foot drop causes. Obviously, a fractured fibula, often injuring the Peroneal nerve, can cause a foot drop; it's not likely to find it's way into the chiropractic clinic, at least not initially. Just this week, I received a letter from a lady who broke her femur whilst skiing. For reasons unknown the surgeon concealed from her that the burning pain in her lower leg, and foot drop were from damage to the sciatic nerve. A swollen so called lateral compartment in the calf, caused primarily in sportsmen, needs to be taken seriously as it can affect both the blood supply and the peroneal nerve; it's extremely painful. Finally, to the guts of this page; a herniated disc in the lower lumbar spine usually will affect the sensory nerve only, causing tingling, numbness and pain in the leg. Less commonly, the motor nerve may be affected too; the pain in the leg then is severe and, over and above sensory changes, one or more muscles may become weak. It happens very suddenly, and takes months to recover; medically it's considered a surgical emergency. More about that later. If the S1 nerve root is affected, most commonly there is difficulty standing on the toes and raising the heel, due to weakness of the calf muscles. Stand behind a chair, first bending the knee of the affected leg slightly, and then stand on the toes of the healthy leg; remember what you feel. Now repeat, standing on the naughty leg. Can you raise the heel easily? If the L5 nerve root is affected, you will have difficulty raising the great toe. Tibialis anterior causing the classical drop foot syndrome. Quadriceps causing weakness at the knee. Your chiropractor will have you lie flat on your back with the legs stretched out. First you'll be asked to pull your foot upwards and outwards against resistance, testing the peroneus longus muscle by comparing right and left. Then you'll be asked to raise the great toe and he'll pull downwards, testing Extensor Hallucis Longus. Then she'll ask you to pull your toes up and inwards, testing the Tibialis Anterior; this is the one causing the classic foot drop. Thereafter you'll be requested to stand on your toes and raise the heel, testing the calf muscles. Finally, you'll be asked to bend the knee and test the quadriceps muscles. Obviously many muscles may be affected, and the astute examiner will be looking too for a wasted buttock muscle, for example. The chances of drop foot recovery after a non painful onset are slim. Very careful blood sugar control in the diabetic may result in strength returning to the muscle. That would mean disciplined daily exercise like cycling or swimming and complete avoidance of high glycemic index carbohyrates, increased vegetable protein and the healthy fats in olive oil and avocado and nuts and seeds, but not seed oils. Butter is back but remains controversial, as does canola oil. Likewise drop foot recovery after polio, amyotropic lateral sclerosis, MS and muscular dystrophy are unlikely. Recovery after painful conditions like a compartment syndrome or a herniated disc drop foot are more likely but strict adherence to these slipped disc rules, for example, are imperative. The onset of muscular weakness after a herniated disc is usually considered a surgical emergency; for the first twenty five years of chiropractic practice, I would immediately refer the patient to a surgeon. However, research shows that if you are able to avoid surgery, in the long run you'll be far better off. That will mean stopping in your tracks for a period. In order to recover from a fully prolapsed, extruded or sequestered disc, you will have to stop sitting and bending, and controversially taking regular intermittent bed rest. I say controversially as bed rest alone will not help these serious conditions; in fact it may aggravate them. But, coupled with exercises done every half an hour, and chiropractic help, massaging bed rest is a must in my book; unless the patient with a herniated disc and foot drop is able and willing to do that for several weeks I won't accept them as a patient; it's a waste of their money and my reputation will suffer as they will end up under the knife. Do not get involved in the bath vs shower debate incidentally; those with a herniated disc must not get into the tub. Of course, if you go for surgery, you won't be allowed to sit or bend for several weeks, and probably several months, anyway. Once the herniated disc drop foot is established, the chances of recovery are slim, and a foot drop brace, or shoes for drop foot, become a necessity; without, you cannot walk safely without tripping and falling regularly. With chiropractic help, if the pain in the lower leg recedes, and the Slump Test for Sciatica becomes negative, then the strength will usually gradually return to the leg; you can be fairly assured that the herniated disc foot drop will return, if not to normal, close to normal. It will take some months. Be guided by your chiropractor; he or she will direct you. On a personal note, I have myself suffered from a sequestered lumbar disc. It affected the Femoral nerve, so there was no herniated disc foot drop; instead there was severe pain in the upper thigh, and the knee began to give when walking. After two weeks of massaging bed rest, lower back exercises, cold hot therapy and chiropractic manipulative treatment, the pain subsided; the strength in the quadriceps muscle returned within six weeks but it took nearly six months before the numbness in the inner lower leg abated. That was thirteen months ago; yesterday I dug a bucketful of sweet potatoes; it doesn't get much more difficult than that! Go from Herniated Disc Foot Drop to Chiropractic Help home page. Go from Herniated disc Foot Drop to Slipped Disk home page.